Playing a sound/music from a variable label — Welcome to the GameSalad forum! Hi, I have a number of MP4 sound files loaded labelled eg. car, cat, dog etc. How do I specify playing a sound file using a variable called e.g. CurrentLabel which is loaded with one of the sound labels eg. "cat"? You can't. I sure wish you could and people have asked for it but you can't. The best you can do is create a rule for every possible sound file you plan to use. Is there an easy way to loop through the list to query the label and play the sound? I'm not sure what you mean exactly but without attribute support for sound files, there's no way to automate this. You'll need a rule for each sound file. Ugh. What do you mean by variable? So what is his question? I understand attributes can be used to play music. 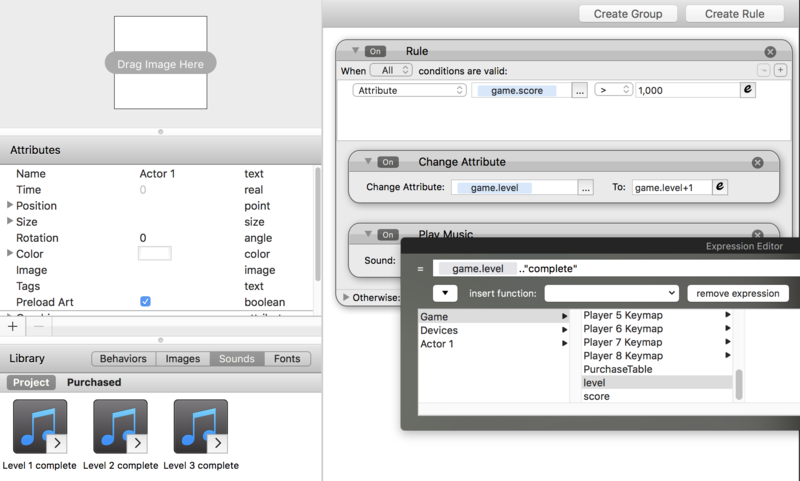 One big change made to GameSalad was when the Change Scene behavior was altered so it included an expression editor. That allowed for dynamic selections of scenes instead of having to pick a scene from a drop-down menu. 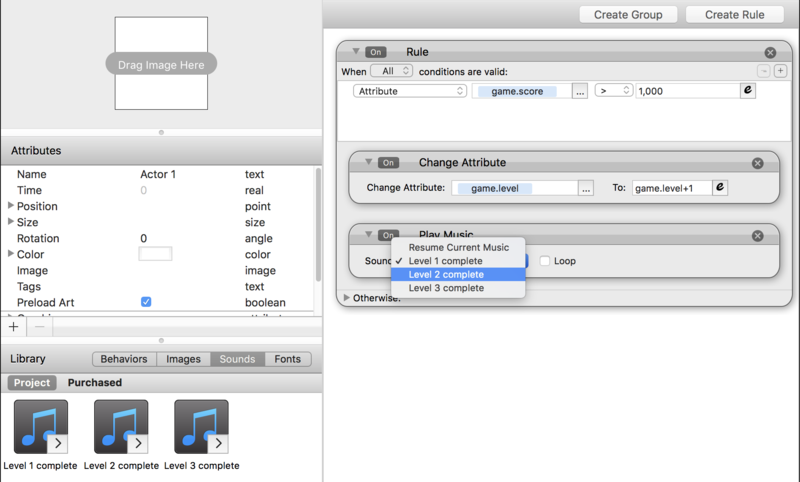 I believe @helpingtogrow wants the same option for Play Sound or Play Music: to be able to use an attribute/expression instead of a drop-down menu. Hm, I still don't get it. It isn't important for me though, I was just trying to understand what was going on. Thanks @tatiang. So instead of having 30 different rules for 30 different sound files, you could accomplish the same thing with a single rule using attribute values, expression concatenation, etc.? Anyway, it would be WAY more efficient in terms of coding time. *Oops, I was rushing... it should have been "Level "..game.level.." complete" but whatever. Ok I get it now I think. Thanks.